The event was reported in the ILN of 1 May 1869: The amusing exercise of riding upon the two-wheeled velocipede, or bicycle, has been taken up by the enterprising gentlemen of Liverpool with extraordinary spirit. The Liverpool Velocipede Club...has enrolled a large number of active members. 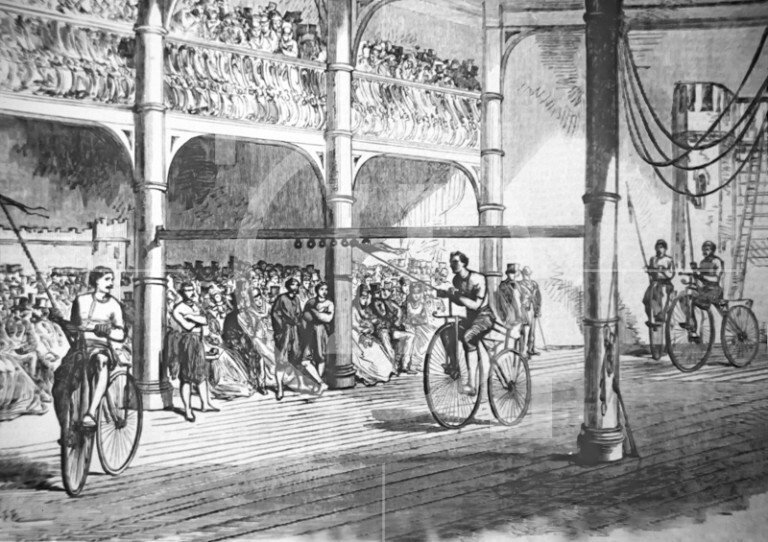 Races open to general competition and special matches of speed have taken place, before a multitude of spectators, in the neighbourhood of the town; but the bicycle tournament, on Saturday last [24 April 1869] at the gymnasium conducted by mr John Hulley, in Myrtle Street, was an event of still greater interest. The sports were performed under the direction of Mr Anderson, master-of-arms at the gymnasium. The bicycle practice embraced tilting at the ring, throwing the javelin, fencing with swords, sundry evolutions and what was described as fancy riding. In all these feats the velocipedeans displayed perfect mastery of the machine, guiding it with the left hand.